The weather has been glorious here in the Shenandoah. I, however, have been mired in assignments for my teaching license, substitute teaching, student teaching, studying for my Social Studies Praxis and bartending. Yes, bartending. I hated to take on another job, but with the bad weather over the past few months, substituting has been far and few between. So, I am back at my old, old job of bartending. This is not an ideal situation but, at least it is a profitable one. Of course, once I took on another job, the schools started calling again and time came to complete my student teaching. When it rains, it pours! Richmond Sampler has taken a back seat for the time being, but I miss her so much! I wish that I had pictures but I am writing this from the keyboarding class at the middle school where I am subbing. Sorry! But I at least wanted to check in with everybody and say hello. I am woefully behind on my blog reading, so if you have not heard from me, I promise to get caught up and write soon! The comments that you all have left on my blog mean the world to me. 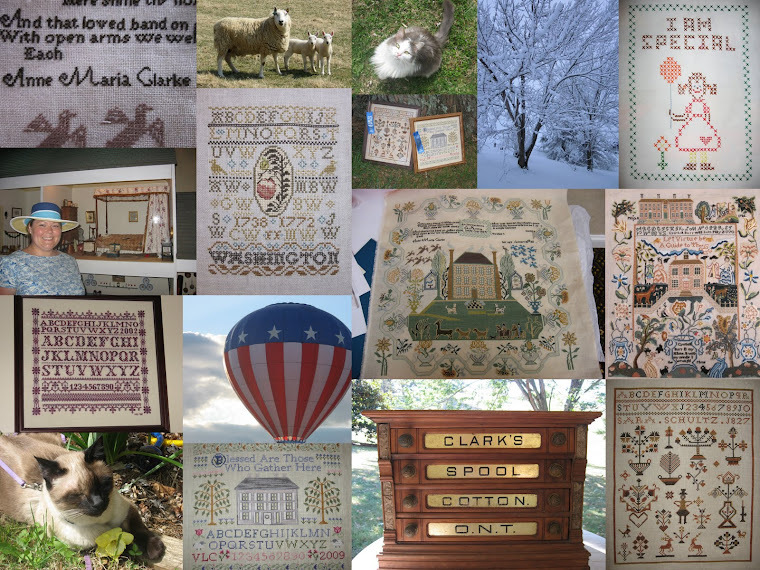 My stitching friends have really brought rays of sunshine to my otherwise overly busy, stressed world. Thank you so much! Interesting... substitute teaching and bartending! Hey, whatever pays the bills, right?! Hope you can get some stitching time in between jobs. I do like your combination of jobs!! But I'm sure that each is very interesting in it's own right. You've probably got some great stories to tell. Hope that things calm down for you for a little bit and you can get some stitching in again! Oh wow! what a combination of jobs! I hope the stress levels aren't too bad for you -- sounds like you're busy! I hope you get a chance to work on your Richmond Sampler again. I love seeing pics of your progress! Wow Valerie! You sound pretty swamped! I'm sure you'll be things calmed down soon. For one thing, there is only about 1 quarter of the year left that you'll be teaching right? The teachers here get less amount per month, but they are paid all year 'round instead of having to go the summer without a paycheck. Look forward to progress pictures of your sampler soon! Valerie, you are one busy chick! I don't know how you do all that you do. Student teaching alone is a full time job, as I remember from many moons ago. :) Hang in there... in the end, after you get your own classroom, it will all have been worth it. Hope you get some stitching time soon. So glad to see you popping in! Good luck on the Social Studies praxis this weekend! You are so right about it pouring, but just think it will be all worth it when you get your license! Man! You are one busy girl, aren't you!? Try not to be too stressed out and do well in all you've got going! Sounds like life is very busy for you these days Valerie. Hope you can get some stitching time in soon. Please come pick up your Sunshine Blog Award from my post: http://blueribbondesigns.blogspot.com/ - I always enjoy your creative and inspiring blog posts! Wow you have been very busy! I hope things settle down for you soon so you can get some stitching relaxation in.